Frederick Walter Harrison was born in Yeovil in 1892, the eldest of the nine children of Walter Edward Harrison (1870-1911), originally from Birmingham, and Nellie née Hambridge (1872-1942) of Yeovil. Walter and Nellie's children were Frederick, Daisy Maud (1893-1972), Elsie Florence (b1895), Ivy Beatrice (1897-1952), Gertrude Rosa (b1900), Olive Mary (1902-1987), Doris (b1905), Phyllis Kate (1908) and Arthur (b1909). Walter Harrison died in early 1911 and by the time of the census Nellie was a 39-year old widow with eight children at home, the youngest being just 11 months old. She worked at home as a leather glove maker, Frederick worked as a leather dresser at Ebenezer Pittard's leather dressing yard at the bottom of Mill Lane and his 15-year old sister Elsie worked as a leather glove machinist. The family lived at 67 Park Street. Frederick initially enlisted in the Somerset Light Infantry around 1915. We don't know his Service Number with the Somersets and therefore cannot be sure which battalion he served with, it was most likely the 1st Battalion which was in England between 1913 and 1914. The battalion, as part of the British Expeditionary Force, fought on the Western Front from August 1914 as part of 11th Brigade of the 4th Division. (The 2nd Battalion was in India during the same period and remained in the country until 1917). Frederick is known to have fought in France but fell sick and was returned home to recover. However Frederick was to transfer to the 7th (Service) Battalion of the Gloucestershire Regiment. His new Service Number 25867 indicating that he transferred during November or December 1915. 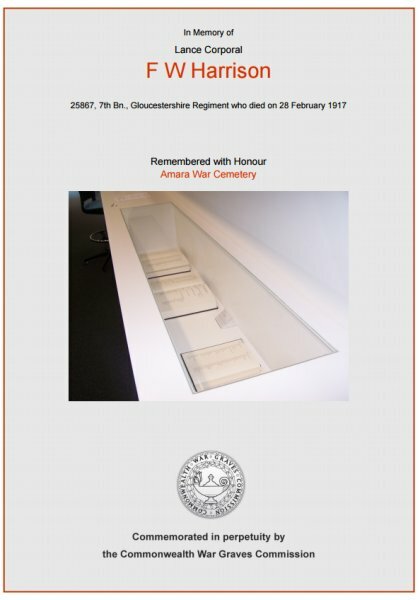 It appears there was a group transfer of men from the Somersets to the Gloucesters (hence the reason I suspect he was in the 1st Battalion) as fellow Yeovilian Walter Brown also transferred at the same time, receiving the new Service Number 25864 - just three away from Frederick's. The 7th Battalion, Gloucestershire Regiment, had been fighting in Gallipoli but moved to Egypt in January 1916. The 7th Battalion landed at Basra (in what is now southern Iraq) on 4th March 1916, after leaving Gallipoli for Egypt in January. In April, 7th Battalion took part in the costly and doomed effort for the relief of the besieged garrison at Kut al Amara, where Major-General Townshend's Division was encircled by a Turkish besieging army. Frederick Harrison died from his wounds on 28 February 1917. He was just 23 years old. In its edition of 18 March 1917 the Western Gazette reported "Mrs N Harrison of 10 Park Street, has received the sad information that her eldest son, Private FW Harrison, of the Gloucesters, has died of wounds received in action in Mesopotamia. Private Harrison (who was 23 years of age) enlisted in the Somersets about two years ago, and had served in France when he fell sick. He was brought home, and later transferred to the Gloucesters, and sent to Mesopotamia, where he had been for over a year. The deceased soldier was at one time employed in the dressing yard of Mr E Pittard." Frederick's name was inscribed on the Shaikh Saad Old Cemetery Memorial in the Amara War Cemetery, Iraq. His name is also recorded on the War Memorial in the Borough. The Commonwealth War Graves Commission certificate in memory of Frederick Harrison.